It’s now almost the middle of June, and even in our normally murky part of Fife we’ve been having some glorious sunshine. While the sunny weather makes it nice to get down to the beach or up onto the hills with our four legged friends, weather like this makes it easy to miss one of the most important indicators of disease that we have. I’m talking about how much water the animal drinks. Dogs and cats don’t drink for fun like we do, so if they’re drinking more, then there’s usually a reason for it. When it’s warm like now, it’s easy to assume that the increased thirst is because of the weather. Sadly, this is not always the case and this past few weeks we’ve seen several patients with serious illness whose owners had ignored the fact that their pets were drinking more than usual. 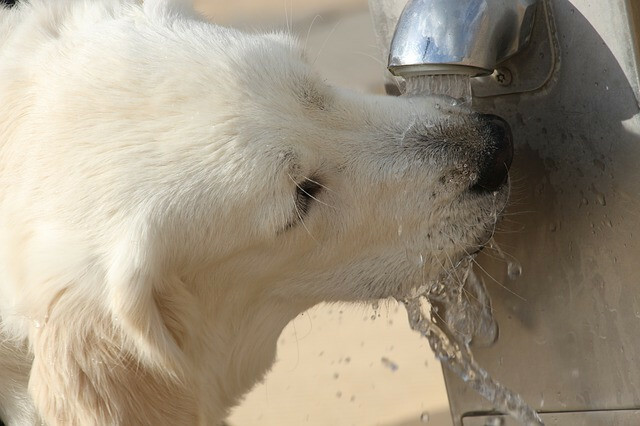 We have a long list of diseases whose main or only symptom is increased thirst, so if you have a pet that’s drinking more, it’s really important to get them checked. When you bring your thirsty pet to us, always try and bring a urine sample. If you don’t bring one, we’re going to ask you for one anyway. It’s also really important never to withhold water from a thirsty animal. If we assume for a moment that there is a disease that’s causing this increased thirst, what this means is that something is interfering with the kidneys’ ability to regulate water balance. Pretty much the only thing keeping the animal’s circulation going is their ability to drink fast enough to replace the fluid that they’re losing in the urine. A common misconception is that a normally well house-trained animal toileting indoors (typically overnight) is doing this because they are drinking too much. The reality is that they are drinking more because they’re producing so much urine, rather than the other way round. So, when you withhold water from these thirsty animals, they quickly start to become dehydrated, and we get an acute renal failure on top of whatever else is going on. This can have fatal consequences. In summary, if your dog or cat is drinking more, let them drink, take them to the vet, and bring a urine sample. If you want to know how to collect a urine sample from a dog, there are instructions here. Protect Against Fleas and Ticks Now.